Club Penguin Cheats by Mimo777 Club Penguin Cheats by Mimo777: Club Penguin Mystery Chair Furniture Christmas Item Revealed! Club Penguin Mystery Chair Furniture Christmas Item Revealed! Cool! Club Penguin has revealed BEFORE Christmas what the Mystery gift is! 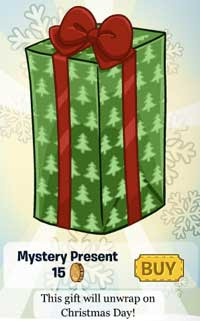 Remember this Mystery Gift was in the last Club Penguin Furniture catalog? Well here it is! Thanks Me Santa for showing us the Chair! COOL CHAIR! If you didn't buy this gift yet, you can now just BUY the Mystery Gift and it will show you the Chair! Thanks, Z458 for the tip! Hey Mimo! Did you notice that the newspaper sid the party will end on the 27th, but the blog said it will end the 28th? MERRY CHRISTMAS MIMO AND ALL OF THE CPG GANG! Merry Christmas, y'all! You guys are the best! It didn't work for me. I wonder why. I wonder why they did the American flag? It's not like they don't have players from all over the world. Bah humbug!!! just kidding! MERRY CHRISTMAS EVERYBODY!!! hey mimo its funny because i bought like 25 of tose gifts and now i have too many chairs!thats enough chairs to make chair land weeeeeeeeee.hey mimo by the way dont you thing that cp should release an option to sell your clothe and items! Merry Christmas Mimo! Wat did u get? I got a ripstik and more. Merry christmas! I expected CP to do that cuz they always put the catalogs the night before the actual day theyre supposed to be. Cool chair! It looks like one you'd see Santa sitting in at the mall. Yeah i know! Some items I hate that i buy for like 560 coins! Maybe you should suggest that to CP. hi there could mimo or any the mods tell me what time zone this website is? Also Mimo why dont you start a blog asking what everyone got for christmas!!!! IF YOU DO PLEAS GIVE ME SOME CREDIT FOR THE IDEA! Huh. I didn't notice that. good eyes. GOOD IDEA! and you could sell to non members! wow. portal box! very lovely! Heyy! i got alot of stuff for christmas :D like Games- Xbox360 Games :) and alot more :D Bye! Hi everyone. Merry Christmas! It is 6:01 am on the east coast and my present still won't open. Why? ..... :( I CAN'T GET THE CHAIR!!!! 361,937 coins?!?! I have, like, 19,000, that's a lot, but compared to THAT number, I'm like about 15 coins! Lol, that's a sweet chair! Merry Christmas! WOW you gots a lot of coins! Mimo's just going to make a post about what he got for Christmas and you and I can commment. If you're saying like the party's and such Mimo plans on this website it's cp time. Hey mimo it's wierd when i went online to check on the present it was still wrapped. It wasn't a chair. I WANTED A DANG CHAIR! My present is still wrapped. Why? mimo, i got a idea, the banner is blank becuz its the wrong way round! your looking at the back. and also hav u noticed that in the epf area, if you hva ur mouse ova it there is a santa suit? suit! It is so cheap for such a nice chair. You should thank Billybob. mimo, i got an idea, the banner is blank becuz its the wrong way round! your looking at the back. and also hav u noticed that in the epf area, if you hva your mouse ova it there is a santa suit? suit! Ok. Nice cheat and good thinking but I personally think it would be too hard to download or it is a mistake. Plus this is not the blog where you tell that. That was father down and you had to check it to beable to answer it. Please stick to the topic thank you. One more thing. Cheats are always welcomed. Not stuff from another blog, unless it it really, wicked important. : 0. . . ha ha ha. when i went on this morning it didn't work for me, either, but then i went on again an hour ago, and the chair was there. so maybe you have to go on two times today to get the chair? how do i open the present?? We should also be able to trade. It would be so cool. It is probably a glitch on club penguin. Sorry for your troubles. how do i open a present?? my presents wont open!!! whats wrong??? YA MISS ME? I BET YA DID!! dangg now i got 50 of those! Look my present is not opening! Something is wrong!! !